Twenty years ago this month, I moved to California. I arrived as an eighteen year old — a boy who’d never lived outside Philadelphia, never seen the Pacific Ocean, never tasted a burrito, never played tennis outside in January. But I didn’t move for the natural beauty, for the food, for the weather — I came because of the people. Per capita, Silicon Valley has more amazing, ambitious, thoughtful human beings than anywhere — and that means more opportunities to work, play, and learn with phenomenal individuals. I ran into my freshman RA on a street in Palo Alto. Fast forward a few months and he was helping me on my longtime side project Team Rankings. Fast forward a couple of years, and we’d turned it into a profitable company and he was the CEO. Around the same time, I had lunch with a friend I played pickup soccer with; he told me about his new startup called LinkedIn. They had some interesting data and a strong team. I soon joined him at LinkedIn and built the company’s early analytics team. In the summer of 2005, I hosted a barbecue where guests included a friend I biked with and a friend I went to basketball games with. The cyclist used my laptop to demo his startup’s new product; the basketball fan loved it and decided to make the first investment in YouTube. While at LinkedIn, I invited three friends I played squash with to the office for lunch. We wound up hiring two of them and both became exceptional employees. Each of those was serendipitous, but that serendipity was fueled by Silicon Valley’s large number of ambitious and thoughtful people. Palo Alto’s greatest problem right now is the Bay Area’s massive job growth. Palo Alto’s greatest opportunity right now is the Bay Area’s massive job growth. Job growth should mean ambitious, thoughtful new neighbors for me and revenue for the city — like taco trucks on the corner means delicious food for me and business for the truck owner. But the mayor’s words say something else: ambitious newcomers, please stay out of Palo Alto. This anti-newcomer mindset is thriving across the country, led by Donald Trump. Trump shocked many Americans with proposals to build walls and require religious tests for potential immigrants, but he’s struck a chord. In Palo Alto, the words and tactics are different, but the goals are the same: Mayor Burt and “residentialist” candidates for office like Lydia Kou instead repel newcomers with policies that make it impossible to build new housing. City hall has, and is, allowing excessive development to overwhelm our infrastructure: our streets, parking, schools, parks, and other civic facilities. What does this “excessive” development look like? In 1960, Palo Alto’s population was about 52,000 and its median home price was double the national median. Today, the population is about 66,000 and the median home price is over ten times the national median. That change represents a population growth rate of under 0.5% per year — with fewer students in the city’s schools and fewer schools than there were a generation ago. Residentialists like Lydia Kou oppose major improvements to transit infrastructure and then claim that the infrastructure is “overwhelmed” and can’t support any additional growth. When Mexico sends its people, they’re not sending their best. They’re sending people that have lots of problems, and they’re bringing those problems with us. Trump, Burt, and Kou all seek to return America to its suburban, homogeneous, 1950s self. And on some level, this is understandable: change is hard. It often means a step back, even if there will soon be two or three steps forward. Yet because change is hard, public servants and candidates need to lead, and that means working through challenges. The Trump-Burt-Kou approach of putting up walls (literal and figurative) embarrasses me as an American and as a Palo Altan. I’m ashamed that a major presidential candidate wants to impose religious tests on people coming to the USA. And I’m embarrassed to read that my mayor is telling companies to go away from Palo Alto. When Trump revealed strong anti-immigrant stances, many prominent people took a rare risk by publicly rebuking the candidate and his ideas. Likewise, there’s a growing realization among Silicon Valley’s leaders that the Burt-Kou never-build-anything approach doesn’t work and leads to housing shortages and unaffordable home prices. Unfortunately, neither the residentialists nor the Trumpians are going to go down easily. We don’t want to turn into Manhattan. It’s dense enough for many residents to walk to work and services. The bike infrastructure is outstanding (far better than Palo Alto’s), so many people bike around town. Buses are frequent, clean, and well-used. Parking downtown is expensive, so people think twice before driving there. Lucerne has elegantly mixed old and new: many seven-story buildings sit right by an 800-year-old bridge, and both residents and tourists enjoy having the best of two worlds. From the bridge, it’s about a ten minute walk uphill to the outskirts of the ancient city. 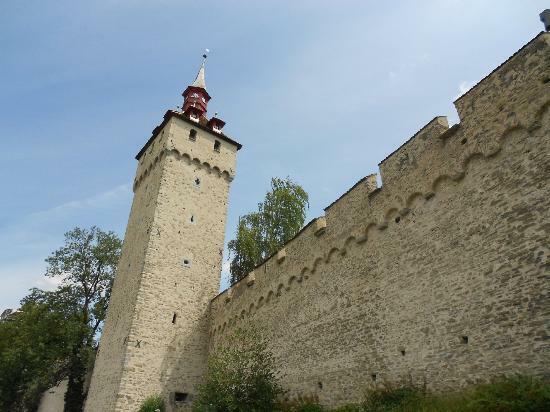 When you get there, you find the Musegg Wall, built in 1386 to protect the city. The massive, well-constructed wall is largely intact. It’s a reminder that not so long ago, Europe was a dangerous, violent place, where people had to build walls to keep intruders out of their towns. At various points in the past 630 years, the people of Lucerne started trading with their neighbors, they met spouses in the next town (or country) over, they moved to and from Lucerne, and the walls became ornamental. Lovely as Lucerne is, I doubt I’ll ever live there. But what about my home? Will it be walled and closed like the Lucerne of 1386? Or will it be open, free, and growing like the Lucerne of today? For the sake of openness, freedom, and growth, I hope those walls remain part of a distant history. A number of people have asked me which candidates are most supportive of additional housing. In Palo Alto, I believe the best choices are Adrian Fine, Don McDougall, Greg Tanaka, and Liz Kniss. I’m going to vote for Hillary Clinton for president.